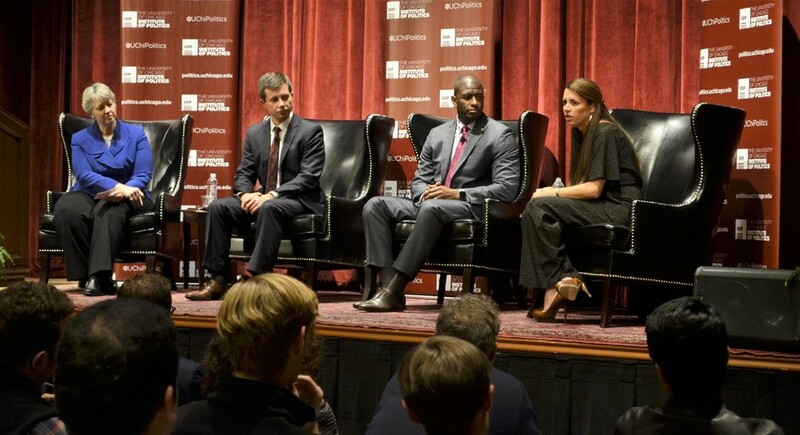 On Oct. 20 former mayor of Houston Annise Parker (left) and the young mayors Pete Buttigieg, Andrew Gillum, and Blair Milo (left to right) discuss methods to solve challenging problems in their respective cities. Three young mayors spoke about the challenges city governments face as part of a panel hosted by the Institute of Politics at International House on Thursday. The panel was moderated by Annise Parker, the former Democratic mayor of Houston, Texas. It included Pete Buttigieg, age 34, of South Bend, Indiana; Andrew Gillum, age 37, of Tallahassee, Florida; and Blair Milo, age 33, of La Porte, Indiana. Buttigieg and Gillum are Democrats; Milo is a Republican. Asked what spurred her to seek office, Milo described the budget crisis facing La Porte. Gillum, meanwhile, pointed to local crime. “Particularly coming after the Ferguson incidents, we had different sides of our town that experienced my city differently... We had a survey done, and 90 percent of the people said that they feel safe in our city,” he said, before describing two teenage boys he met who said their mother did not allow them to sleep in beds for fear of them being shot straight through the window. Gillum’s efforts to combat this “disparate experience,” he said, have centered on conversations between residents of different neighborhoods. The mayors agreed that facilitating productive city council meetings, managing their hourly schedules, and navigating heavy press attention counted among their most surprising difficulties upon entering office. They also stressed that local government is complex, rewarding work—“harder and better” than he had imagined, Buttigieg said, emphasizing mayors’ immediate, constant responsibility to their constituents.